Every November we take an entire Thursday to give thanks, spend time with friends and family, and eat. And eat, and eat. There’s also a tradition of sharing everything that you’re appreciative of. As you go around the dinner table sharing what you’re thankful for this Thanksgiving, let our Lewisburg dental office give you a few reasons why your teeth should be on that list. Our teeth not only help us eat, they also aid in helping us speak and pronounce words properly. Teeth allow us to form certain sounds and without them, we’d have a difficult time pronouncing any word that contains an ‘f,’ ‘v,’ ‘s,’ ‘th,’ or countless other sounds. When people have difficulty forming certain words or sounds, they may be helped by their dentist in Lewisburg, orthodontics, and a speech therapist. Everyone at our dental office in Lewisburg wishes you and your family a very happy Thanksgiving! 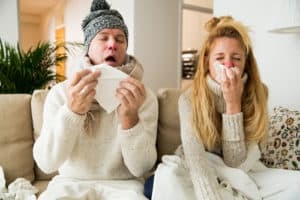 According to the Centers for Disease Control and Prevention (CDC), the months of October and November are when influenza activity begins to increase. And although flu season doesn’t tend to peak until December through February, getting ahead of the flu and preparing yourself and your family to avoid it is half of the battle. Our dental office in Lewisburg compiled the top tips to help you prevent the flu this year. Along with eating well, drinking enough fluids, particularly water, keeps your body working the way it’s intended to. A well-hydrated body keeps white blood cells healthy and ready to fight off germs. Plus, it will make your dentist in Lewisburg happy, too. The team at our Lewisburg dental office hopes you and your loved ones avoid the flu this season, but if you happen to come down with it we encourage you to use sugar-free medications to keep your mouth protected. Accepting new patients from Lewisburg, Selinsgrove, and Williamsport.